Original title: “In the Picture”. 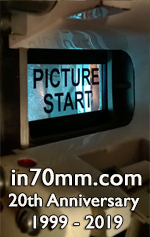 Filmed in: 3x35mm, 6 perforations, 26 frames per second. Principal cinematography filmed in: Cinerama with camera #3. Presentation format: Cinerama and 7-track magnetic stereo. Aspect ratio: 146 degrees. Country of origin: USA. Year of production: 2012. Released by: Cinerama Inc. Release date: 30 September 2012. Premiere cinema: Cinerama Dome, Los Angeles, USA. Filmstock: Fuji F 64D stock. Color by: FotoKem. Laboratory liaison: Walt Rose, Andrew Oran. Titles: _______. Number of Cinerama prints: 1. Sound system: 7-track magnetic stereo. Original sound recorded by Chase sound, on refurbished Cinerama equipment made by the late Jack Dimmers, Teccon Inc. Cinerama running time: Approx 14 minutes. Distributor: Cinerama Inc. Locations: The Hollywood Heritage Museum, Disney Concert Hall in downtown Los Angeles, ______. Interior scenes will be shot at the Cinerama Dome in Hollywood. Synopsis: A young visiting couple from out-of-town, is led on a guided tour of Los Angeles and it’s environs, by a familiar resident (Stanley Livingston) and his wife (Paula Drake), all captured by the panoramic, triple-lensed Cinerama camera. Some popular and some not so well known sights of the city shine in this urban travelogue lark, including the Griffith Observatory, Angel’s Flight funicular railway, and a sailboat cruise from San Pedro, culminating in the evenings highlight, a visit to the Cinerama Dome theater in Hollywood. This was the first film shot in 3-panel Cinerama system in 50 years. Various: Filming started Saturday 14. January 2012 with 30 background players at The Hollywood Heritage Museum. Last day of actual shooting was 15. May 2012. Notes about the filming: Approx 48 hours shot in 6-7 days - shooting spread over a period of 35-50 days weather contingent. 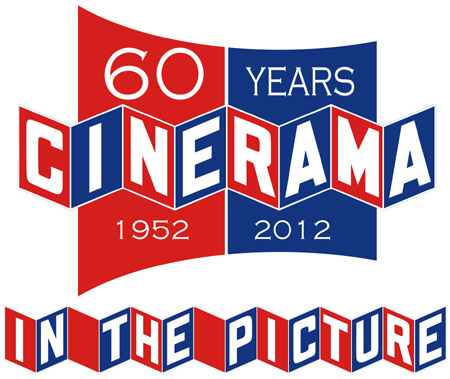 CINERAMA 2012 - First day of shooting "In the Picture"
12-14 minute experimental SHORT SUBJECT. Shooting Jan 2012 to mid March 2012. Post Production April – June 2012. To shoot in the historic 3-panel Cinerama process with modern film stock and the refurbished Cinerama camera. This should be considered an elaborate test or even an experimental film. This endeavor is to supplement the 60th anniversary showing of “This Is Cinerama” and the one week Cinerama celebration at the Cinerama Dome in the fall of 2012. Tickets will not be sold for this short for it is simply an added attraction for those attending the festival. It may also be used in subsequent years at Cinerama screenings in Bradford UK or in Seattle. 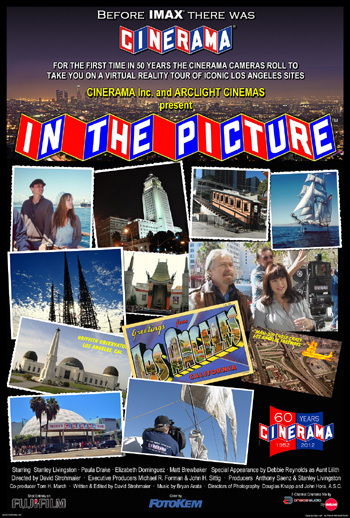 A widescreen short subject about interesting and inexpensive or free things to do and see in the Los Angeles area. We follow our actors traveling in one car. One couple is middle aged (in their late 50’s or early 60’s) and knows what Cinerama is and the other couple is twenty something. They travel the city in search of free things to do and see. Cast is a total of four actors plus a few extras (can be crew members bystanders, etc) for some scenes. They travel the city in search of free things to do and see. They eventually end up at the Cinerama Dome to attend a 3 panel Cinerama show. Cast is a total of four actors plus a several extras (can be crew members, friends, bystanders, etc) for some scenes. The bare essentials: Cinerama camera, Cinerama slate, tripod, extra set of Cinerama magazines, director’s finder, a part time still camera, very basic grip equipment with reflectors, a western dolly etc. Minimum Lighting package (rental lights for 1/2 day shoot at Arclight Cinemas and the Dome auditorium seating area). Minimum (multi-purpose) crew of about 7 - 9 people: DP, Camera Operator, Loader, Director, Assistant Director, UPM/Producer, at least 2 production assistants/runners. In some scenes we will need security officer possibly for 4 days. Approximately 18,600 feet of film stock so shooting ratio will be about 3.3 to 1. Limited liability insurance for shoot, permits on some locations etc. Minivan for camera, minivan for crew, prop minivan. Crew will drive their own cars or carpool with others. Lunches will be provided. Since Cinerama is a very wide angle process, a western dolly will suffice and be smooth enough for all dolly shots (no dolly track necessary). Principal photography takes place over about 6 non-consecutive days, a 7th day (1/2 day) will be for POV shots and any pick-ups. Weather needs to be sunny or partly cloudy representing typical LA weather. (This 6-day shoot could possibly be done over a 3-6 week period depending on weather and actor/crew availability). You will be notified by Tony Saenz or Dave Strohmaier when we know the dates of any shoot coming up. Small digital sound recorder will be used for very limited sound (camera is very noisy!) On camera dialogue by our couples will be very minimal (short lines) and recorded as a scratch track to be replaced later via “poor man’s ADR”. Most dialogue will be voiceover with only occasional “tie ins” with on camera sync dialogue. Voiceovers & Foley will be recorded in postproduction at Dave’s house. Music and sound effects will come from Dave’s royalty free “SmartSound” library. Some behind the scenes HD footage and interviews will be shot for historical reasons and publicity purposes.